This playground includes a giant game court area for basketball, four square, etc. and a tiny but protected sand play area with climbing structures. 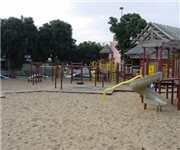 How Would You Rate Hayward Playground?